Lampung and Bengkulu provinces, Komering Regency and the Pasemah plateau are regions of southern Sumatra which, at one time, all came under the influence of the powerful Sriwijaya maritime kingdom whose roots began in 500 AD in the area of Palembang - now Sumatra's second-largest city. Existing within these regions, are many distinct ethnic groups - each having their own unique cultures while sharing many similar traditions with their neighbors. 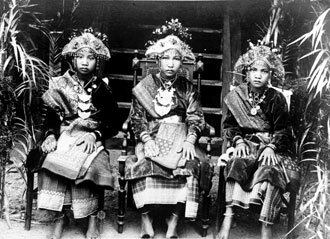 Usually, objects from this this part of Sumatra are easily identifiable as to which specific culture they originated but many are not so readily placed. Although this region is one of the most culturally rich areas on the whole island - with some of the most interesting textiles found anywhere - The East Indies Museum will temporarily devote only one gallery to these four regions. After more material becomes available and more research is done, we intend to eventually separate each of these important regions into individual galleries.